Friday morning, up early and standing on the deck of the ferry as it arrived in Zeebrugge. Anyone who knows our friend Johan, will know that he is not a morning person, but there he was waiting for us on the quayside at 8 am. Clearly his earliest start for years, and we were delighted to see him there. A quick stop over in the seaside town of De Haan, with its Art Deco buildings, and where Albert Einstein lived briefly, and it was off on the highway to Ghent. In the photo above we have Craig, Graeme, and Johan. The City of Ghent, seems to be going through something of a renewal. It’s rediscovering its past, and a huge effort is going on to clean and renovate its medieval buildings. When you see the grandeur of the merchants’ houses by the canals, and the ornately decorated buildings of the medieval guilds, you realise just how wealthy Flanders must have been in the Middle Ages, and how this successful trading nation had the power and wealth to become such an influential centre of culture and art. 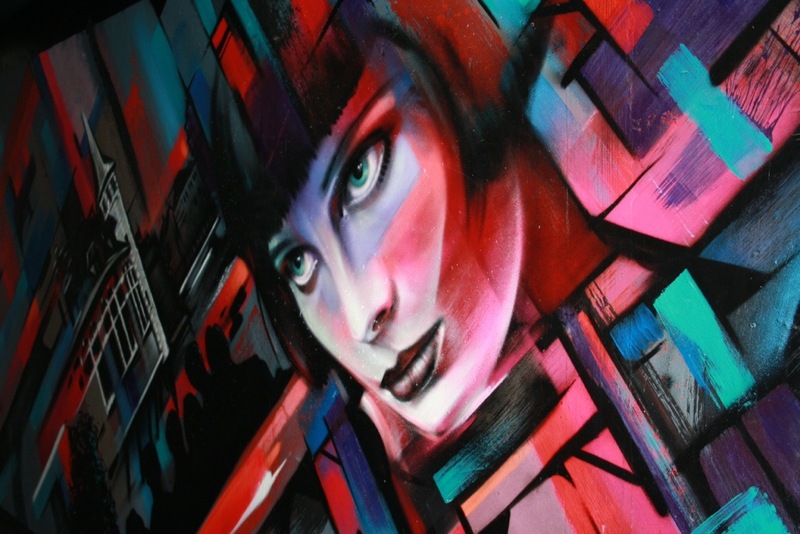 But it’s not all about preserving its past in aspic, Ghent has a vibrancy about it. Above is some street art in Ghent. Time to head off again. Now this is a place preserved in aspic, almost a medieval theme park. It is for all that, quite stunning. Every street you turn down is filled with the most beautiful buildings from the 13th to the 15th century. At that time, it was a major Flemish seaport, but then the delta on which it lay silted up, and it’s now 12 miles from the sea. Obsolete and neglected, it became literally a backwater – falling into decay, it’s treasures were rediscovered in the early 20th century. My cousin Ian Jennings came up from his home in Paris to meet up with us in Bruges. 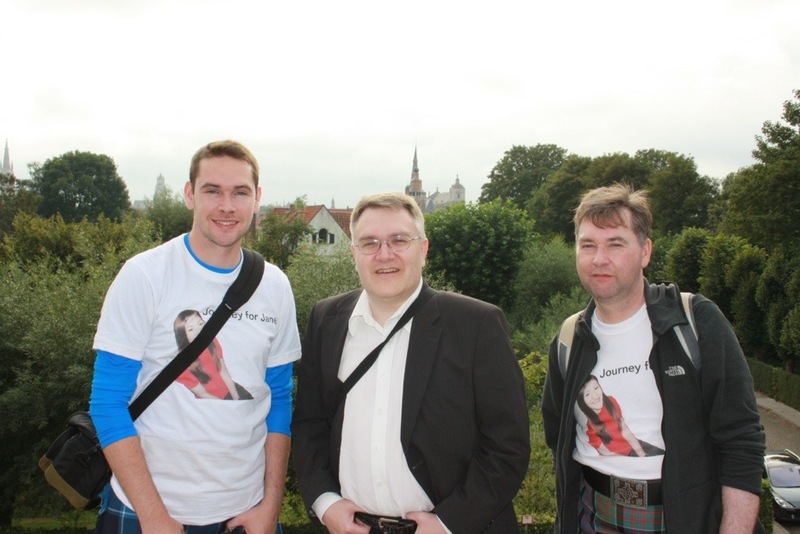 In the above photo, Craig and Graeme pose with Ian. So the four of us toured the streets. 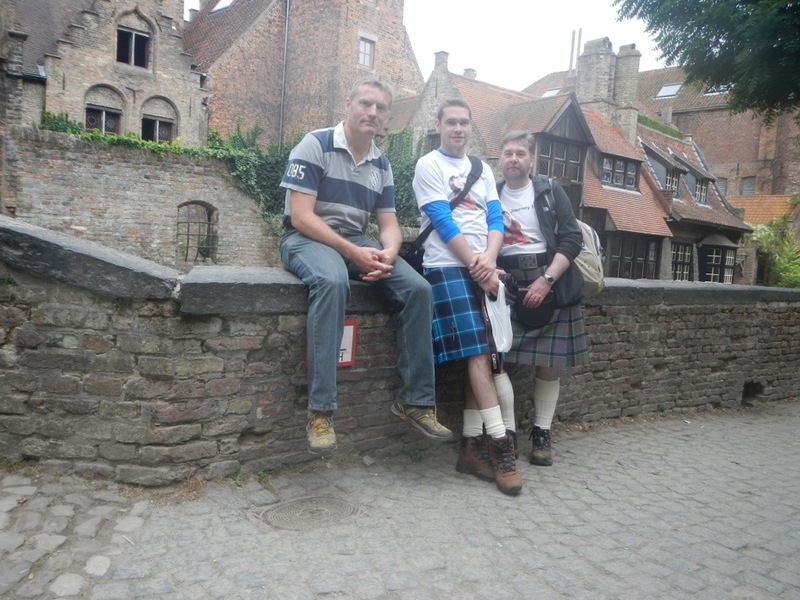 We chose a strange time to be walking through a Belgian city with kilts on, with the national football team playing Scotland that evening, in Glasgow. A few good natured comments that we’d got the venues mixed up. We took the decision not to watch the match, probably a wise one as things turned out. 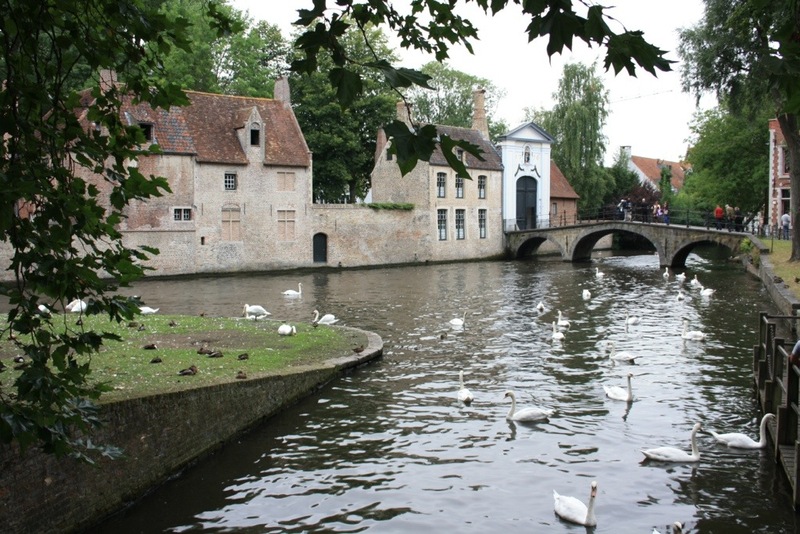 Repeating myself in part just to say I was in Ghent & Bruges 2x about 18 & 17 years ago. I was delighted Craig that you saw your cousin Ian Jennings. Margery will be pleased. I’ll let her know.The news of your great adventure will be known both in Ireland & France!